Following the installation of Akondai, I can sync with google and fetch / update calendar entries, and fetch contacts, but when I try to add the new contact "Google Test" with a phone number of "1234" on my PC using KAddressbook, I get an error - "Failed adding new contact". AgentBase(akonadi_googledata_resource_1): Failed adding new contact. As the entry successfully gets placed into the Akondai sql database, it is assumed that the problem is caused by the communication between Akondai and google. I know that the authentication link is OK, as the rest of the contact information came from google in the first place. Plus, I can modify an entry on google, and see the results within Kontact. It appears that there is a problem with the library that communicates with google. The libraries ARE called akonadi-googledata libgcal. There is currently a known feature whereby contacts that have 1 or more phone number, or 1 or more email address do not synchronise correctly. At present, I am assuming that this is the same cause as above. Akonadi is a program that sits between applications and enables them to share calendar and contact information in an application indepdendent way. I have used it to sync Kontact (KMail etc...) with Google Mail contacts / calendar and in turn, synced that with my Nexus One Android phone. This note describes how to get Kontact to sync with Google, however, for me, there is still a significant bug: When I change contact details within Kontact, Akonadi crashes, and the contact information is removed from Google (although it stays in Kontact). There is currently a known bug in libgcal / akonadi-userdata (versions 0.93 & 1.0.1), which are used to synchronise with Google. The bug means that any contact with more than one email address or telephone number, won't synchronise correctly. More information can be found here. Now interestingly, akonadi requires an sql server (mysqld), however, it doesn't appear to be used for the calendar sync, nor for the contacts retrieval. If you want to update contacts on your PC, however, this is where the mysqld comes into play. 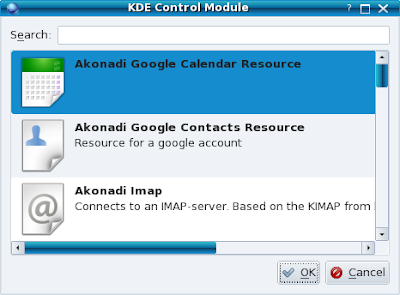 On the Akonadi Resource Configuration tab, select Add, and add the Google Calendar Resource. When prompted, enter your google username (ignoring the @gmail.com or @googlemail.com), and your google password - select OK. The system immediately connects, and if your username or password is wrong, you will be told so here. Repeat the activity for the Google Contacts Resource, and that's it, Akonadi is configured. Open Kontact, and go to the Calendar application. Near the bottom of the screen, is the area where you can select which calendar to use. Click on the green '+' to add a new one. Now, select the Akonadi entry, which will probably be at the top of the list. Give the entry a meaningful name (e.g. Google Calendar), and create it. Make sure the calendar is enabled - you can also set it to be the default one if you wish. That's it - everything synced. The procedure for adding Contacts is identical (but the process is performed on the Contacts page, of course). 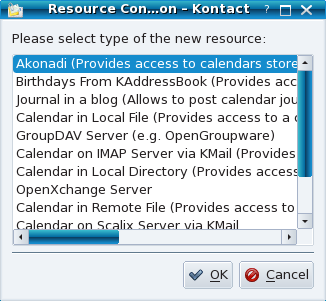 To automatically launch the akonadi server when you start Kontact, it is essential that you make sure that Akonadi is the default for Contacts and Calendar. Shut down Akonadi (shut down the tray application, and kill all the akonadi processes). 100206 10:25:29 [Note] /usr/sbin/mysqld: ready for connections.